Need a return Super Shuttle? Sorry, your next available offer has expired. To request a new offering, please click the 'Refresh' button. In booking this ‘next available’ service the traveller assumes any risk associated with meeting their flight check in time and accepts that SuperShuttle has no liability for any missed flight or disrupted travel costs. In booking this service the traveller assumes any risk associated with meeting their flight check in time and accepts that SuperShuttle has no liability for any missed flight or disrupted travel costs. Use this booking system to secure the next available shuttle. 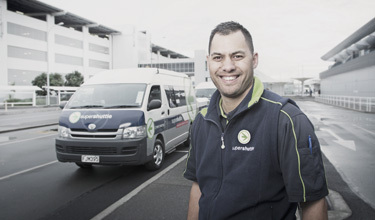 Super Shuttle is New Zealand’s premier airport transfer service providing great value fares, door-to-door, 24 hours/7days, nationwide. We carry all outsized luggage types and our 11-seat mini-coaches can use most bus lanes so you’ll get to where you need to go efficiently and on time. We look forward to you enjoying the ride with our professional, friendly drivers. For not a lot more than our standard Super Shuttle exclusive use service, Platinum offers a lot more features. There’s the leather interior, reclining seats, seat back tables, individual USB chargers to keep those devices online, cup holders, individual air-conditioning, and much more. This is the same as your flight arrival time. After your flight lands and you have collected your bags make your way to the SuperShuttle rank where we will be waiting. Click here to see where you can find our shuttles. This is the same as your flight arrival time. After your flight lands and you have collected your bags, enter the passenger arrival area, where you will see a SuperShuttle driver holding up a sign board with your name. The card number may be invalid. Please re-check. To proceed to Bank Transfer, agree to the "Terms and conditions" then click 'Make Payment'. Please read and accept our terms and conditions to proceed with your booking.